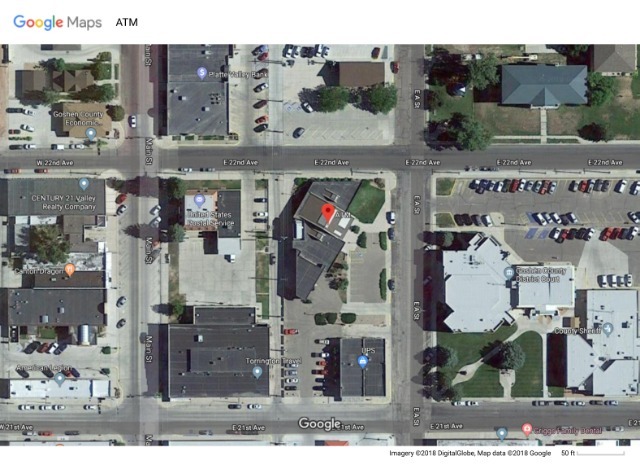 Unique Goshen County Wyoming commercial opportunity. Former Bank of the West building located in the heart of the Torrington downtown business district. Directly across the street from the Goshen County Circuit Court & Sheriff's Department and the United States Postal Service. The building was designed by renowned Cheyenne architect, Noel Griffith Jr. and built 1984. This beautifully designed structure consists of 6,732 SF on the main level with a 6,732 SF partially finished wide open basement. A grand wood beamed entrance welcomes you into an open lobby leading to 8 large offices, a spacious conference room, break room, multi-use rooms and handicapped accessible​ restrooms. This exceptional building sits on a very large 33,639 SF (.77 acre) city lot that includes drive up lanes, attractive landscaping and ample parking, including handicapped. This outstanding property is a great place for your business!